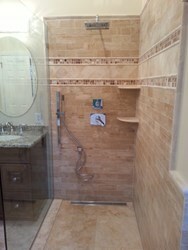 Stone Creek Builders' tips for avoiding the most common technical problems in bathroom renovation. Technical difficulties are one of the most common reasons for construction holdups in bathroom renovation projects, and these glitches are more than just a nuisance – they are expensive for the homeowner. Avoid these technical problems in bathroom renovation and make the process a little more satisfactory with our tips. Resisting the urge to buy a new bathroom fixture from an online photograph or a floor display is hard, but it can save time and renovation hassles in the end. Floor sales people have little incentive to suggest that their beautiful fixtures may not match your plumbing and hot water heater or question if your system can handle the increase in pressure. By finding out as much about the bathroom pipes and water heater as possible, homeowners can avoid expensive glitches in renovating or even an expensive do-over. It will increase the likelihood of success. The all-too-common mismatch of fixtures and plumbing gives a lot of homeowners and contractors real headaches. They must throw out procedures and mechanics and start over, sometimes from the planning stage. The size of the existing pipes and water heater is an important variable. It can increase the difficulty of a technical problem. Measuring the pipes and hot water heater is the simplest way to avoid the problem. Make sure to be aware of the demands on the plumbing and hot water heater that the new fixtures you want to install represent, especially before you decide to buy. Make it a point to match your existing plumbing with the incoming fixtures before the renovation begins. It’s best to work on a good plan to keep glitches to a minimum, but once a technicality happens, you may have to shop around for less expensive alternatives to mitigate the costs of the holdup.